Avoid the lines at your local candy shop and create these beautiful salted caramels. 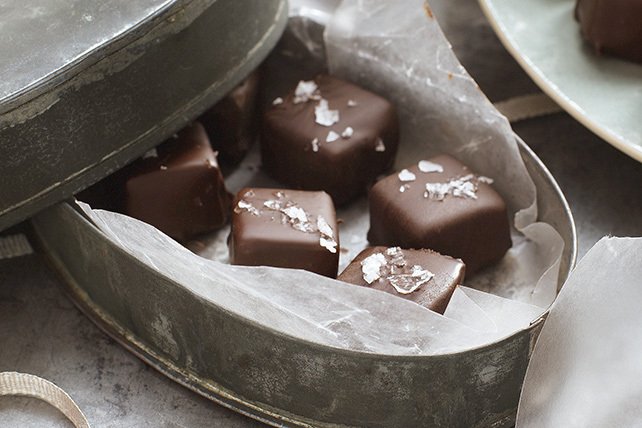 These Chocolate-Covered Salted Caramels are great for gifting. Insert toothpick into 1 caramel; dip in chocolate, turning until completely coated. Shake gently to remove excess chocolate. Place on waxed paper-covered baking sheet. Remove toothpick. Repeat with remaining caramels. Sprinkle with salt. Let stand at room temperature 30 min. or until chocolate is firm. Use a small off-set metal spatula to easily slide the dipped caramels onto the prepared baking sheet. To firm up the chocolate-coated caramels more quickly, refrigerate them until firm.